LEYTE, Philippines – Former first lady Imelda Marcos on Monday, April 25, slammed “government neglect” for Eastern Visayas as she sought to convince voters in the region to support the vice presidential bid of her son, Senator Ferdinand “Bongbong” Marcos Jr. The Ilocos Norte Second District Representative, who hails from Tacloban, made the pitch at a campaign rally in Balyuan along Magsaysay Boulevard. “Aadi ako para mangampanya ha iyo ky an Region VIII maiha na nga gnabandona han gobyerno. 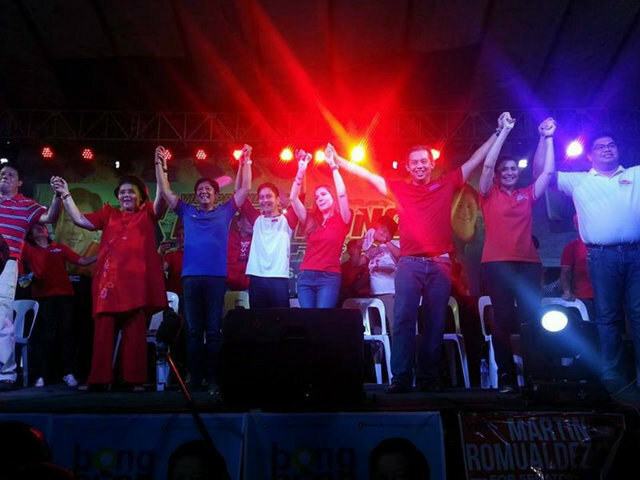 Kinahanglan magkamay-ada kita hin magrerepresenta ha aton rehiyon,” Marcos said amid cheers. “Bongbong is an Ilocano by birth but also a Waray-Waray because he gave his heart to the Taclobanons,” she said, and recalled the achievements of her late husband, dictator Ferdinand Marcos, in Leyte and Samar. Marcos claimed that the government has long abandoned the Eastern Visayas region. Her son, she said, would give the region a voice in the national government. In November 2013, Eastern Visayas bore the brunt of Super Typhoon Yolanda (international name: Haiyan), the strongest typhoon to ever make landfall, which tested the Aquino administration‘s disaster-response capability. More than 7 million individuals were affected by the typhoon, majority hailing from Eastern and Western Visayas. Romualdez, a senatorial candidate, is the nephew of Marcos, and a cousin of Leyte Mayor Alfred Romualdez, who had a run-in with Roxas after the local official claimed that the latter had politicized government relief efforts in his province. 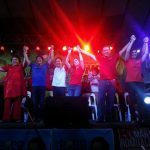 At the campaign rally of her son, Marcos also pushed for the candidacies of her other relatives vying for local and national positions. She assured the crowd that if they vote for the Marcoses and the Romualdezes, the latter will have a nanay (mother) who will support them along the way, a fellow Waray like them. She also encouraged them to vote for leaders who love, care, and serve the people, especially those who will never leave them in times of need. She then cited herself as an example of Waray beauty who, at age 86, still looked like a teenager, and always strived to make herself look beautiful. Joining her on stage were her son, Representative Romualdez, Councilor Cristina Gonzales-Romualdez who is running for Tacloban mayor, Yedda Romualdez who is running for Leyte first district representative, Mayor Romualdez and former Tacloban Mayor Alfredo “Bejo” Romualdez.